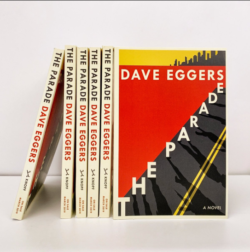 Bestselling author Dave Eggers discusses his engrossing new novel, The Parade. With echoes of J. M. Coetzee and Graham Greene, this timeless novel questions whether we can ever understand another nation’s war, and what role we have in forging anyone’s peace. 15% of the sales for the evening will be donated to 826 Valencia. Dave will be in conversation with Tom Barbash, author of The Dakota Winners.